Someone whose work really inspires me is Alison Fennell. You can find her post and YouTube tutorial here. This is really an excellent tutorial, explained in Alison’s low-key, patient style, of how to paint butterflies in watercolor without being too fiddly. I tend to overfiddle, and so I tried to take Alison’s advice to heart, but I have a feeling I put one too many layers on this one. I’m not sure. I’m very new to watercolor (who am I kidding, I’m new to all of this art business, as my daughter would say), so tell me what you think. Alison also has a beautiful Etsy shop, which I encourage you to visit, as her work is so lovely and delicate and beautiful, as is Alison herself. 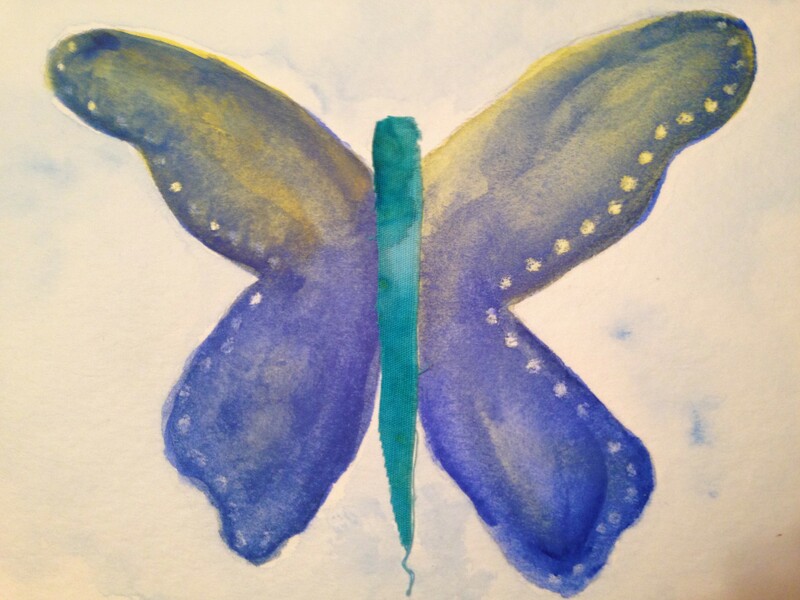 I hope you enjoy my little painting, and if you’re interested in painting butterflies, check out Alison’s tutorial. You’ll be glad you did! Back to my little butterfly, I happened to have a scrap of batik fabric on my table, and decided rather impulsively to trim it up and glue it on as the butterfly’s body at the end. The white dots? White Crayola crayon. Which resisted most of the paint, but not all. Hey, what did I expect? I’ll try it again, though; I enjoyed that quick and easy wax resist! I’ll be working today, so who knows what might be coming up for the letter M tomorrow. I hope you’ll visit again and see. Happy Saturday! Don’t forget to feed your soul, I think it’s getting hungry. < K is for ??? Jodi, your name should be Joy. I hope it’s your middle name. You’re wonderful. Thank you! Darn – wouldn’t that be fun?! … but nope. Hint #2 – one syllable. I like making you guess for a change! LOL! I like the fabric idea. I’ve tried to paint butterflies without much success and always end up turning to collage myself. These colors work well together. Thank you. I seem to feel that so many things improve if I add just a bit of fabric to the mix. I don’t think the color was perfect, but I liked the texture. So, in it went. I’m looking forward to more butterflies in the future. Lovely, you are a courageous artist, always trying new techniques! Thank you, Sharon! We all should have freedom in our artwork. I’m determined not to be constrained. Sometimes I really have to fight with myself. The blog is helping because I have to make something with limited time, so … I usually just say heck with it, and do it. Thanks for your comment, and for reading. Aww thank you!! More to come. It was fun! Thank you! I’ve never studied them, but it sounds like a great idea. I buy my paint at Blick also. Love them! PS you’ll love the tutorial! I love butterflies! I also like the idea of combining different mediums. It sounds fun and, judging from your blog’s content, can create some really cool effects. Anyway, this is nice! I really like Alison’s butterflies too. Thanks for the link to the images and tutorial. I love your butterfly. It couldn’t come at a better time….SPRINGTIME! I really enjoy your journey and thought process of each project you share. You are really educating me. Working with watercolors must be a real lesson in patience, waiting for each color to dry before applying the next color. Let me know if you need a hair dryer to expedite the process. Ha ha. It might make your paper pucker or bubble, which could lead to a new technique to share with your devoted followers. Thanks so much! Thanks for your lovely comment. I was not blessed with patience, and watercolor does require lots of it, as you say. Without a hair dryer, I’d probably go crazy waiting. It’s very useful. Sometimes it’s nice to have a painting on the kitchen table, do a bit here or there, go back to what you were doing, and by the time you revisit, it’s ready to roll. Air dried paint looks much brighter than hair dried, in my experience. The hair dryer can flatten and dull the look of the paints. I’ve found putting it on low heat and holding it away from the painting can minimize that. There’s so much more to learn. For me, it’s never ending, and it’s probably why the medium, and art in general, fascinates me so much. Thanks for reading and commenting! One of my favourites! Would you like to paint another colourful butterfly? Yes, I’d love to! When busy season settles down in a couple weeks, the quality of the art here will (hopefully) improve. I’m glad you enjoyed it!